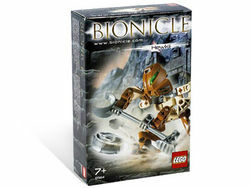 8584 Hewkii is a BIONICLE set released in 2003. It is one of the six Matoran released that year that wasn't with a Rahi. Like the rest of those Matoran, Hewkii came with a Kolhii Stick and a Kolhii Ball. This is a description taken from LEGO.com. Please do not modify it. (see an archive of the product's page) Top koli scorer! Hewkii is one of the most powerful Matoran in Po-Koro, and the all-time top koli scorer! Set includes koli ball and koli stick.